Will the carving of Donald Trump’s face on an arctic iceberg melt or last for a thousand years? Project Trumpmore is aiming to demonstrate climate change in a monumental way. A Finnish NGO wants to commission a 115-foot tall ice sculpture of Donald Trump’s face in the arctic region to demonstrate that climate change is happening. Like the former US presidents on Mount Rushmore, Donald Trump will have his face carved onto an arctic glacier, in order for it to melt. "Global warming is one of the most important issues and topics of today. There are still people who ponder whether it’s a real issue. We want to build the monument for all of us, so we can see how long the sculpture lasts before melting. Often people only believe something when they see it with their own eyes," says Nicolas Prieto, the chairman of the association Melting Ice, which is behind Project Trumpmore. The project started when three young men working in the creative field got enough of talking and wanted to act instead. Instead of filling the world with fake news and alternative facts, this project aims to actually show climate change taking place. "Our starting point was to create something concrete, something people can see and something that makes climate change visual. In general, we believe that a DIY-attitude appeals to people, and it’s certainly the same thing which got us started," Prieto sums up. Project Trumpmore’s goal is to generate conversation and hopefully catch the eye of anyone who is willing to fund our project. Project Trumpmore - Official Trailer from Admin ProjectTrumpmore on Vimeo. This project is a huge challenge and we can’t do this without help. We are now asking everybody to join this movement. It can be made by talking, liking, sharing, funding etc. All possible help is more than welcome. Project Trumpmore is a science/art project by Melting Ice Association, whose intention is to provide a concrete test that shows whether global warming is true or false. 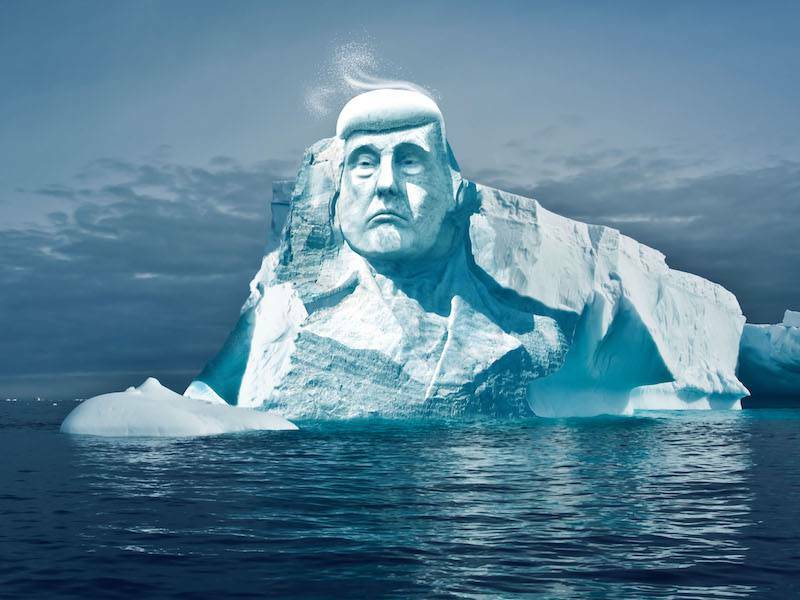 The objective is to sculpt president Donald Trump’s bust into the Arctic glacier and install a camera to the site of the sculpture to live stream its fate. If you want to be involved in sending a message about the hottest topic in the world, come along! Visit www.projecttrumpmore.com and see what you can do to help. Let’s make this happen – together.